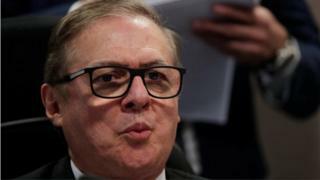 Brazil's Education Minister Ricardo Vélez says school textbooks will be revised so that children are taught "a wider version of history". Mr Vélez denies that the 1964 military ousting of democratically elected President Jo?o Goulart was a coup. He also refers to the 21 years of military rule which followed as "a democratic regime by force". His comments come days after far-right President Jair Bolsonaro announced the coup's anniversary would be celebrated. Mr Vélez told news magazine Valor Económico that school textbooks should "rescue the vision" of the events in 1964 so children could develop a "true and real idea" of what happened. "Brazilian history shows that what happened on 31 March 1964 was a sovereign decision by Brazilian society," he told Valor Económico [in Portuguese]. More than 400 people disappeared or were killed, and thousands more were detained and tortured before democracy was restored in 1985, according to the findings of a 2014 national truth commission. Mr Vélez described military rule as "a democratic regime by force which was necessary at the time" and said the toppling of President Goulart was "an institutional shift, not a coup against the constitution at the time". He said there would be a "progressive shift" in school textbooks to reflect "a wider version of history". The president of the Brazilian Association of Textbooks, Candido Grangeiro, was critical of Mr Vélez's plan, saying that any changes to didactic material were as a rule based on wide academic research and not on opinions. He said his organisation was "opposed to any type of revisionism based on opinions". Asked by reporters following a visit to the Yad Vashem Holocaust memorial and museum in Israel whether he agreed with Mr Araújo comments, Mr Bolsonaro answered "There is no doubt, right?"